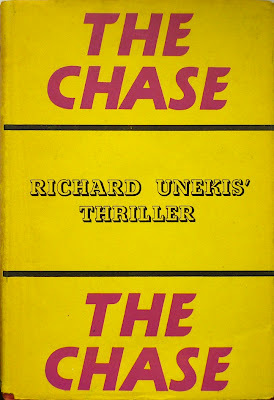 This is the UK hardback first edition of Richard Unekis's The Chase, published by Gollancz in 1963, originally published in the States by Walker in 1962, and subsequently published under the title Pursuit by Signet in 1964. I bought this copy in the Lewes Antiques Centre a couple of years ago, with no real notion of what it was, other than what I could glean from the dust jacket flap blurb. 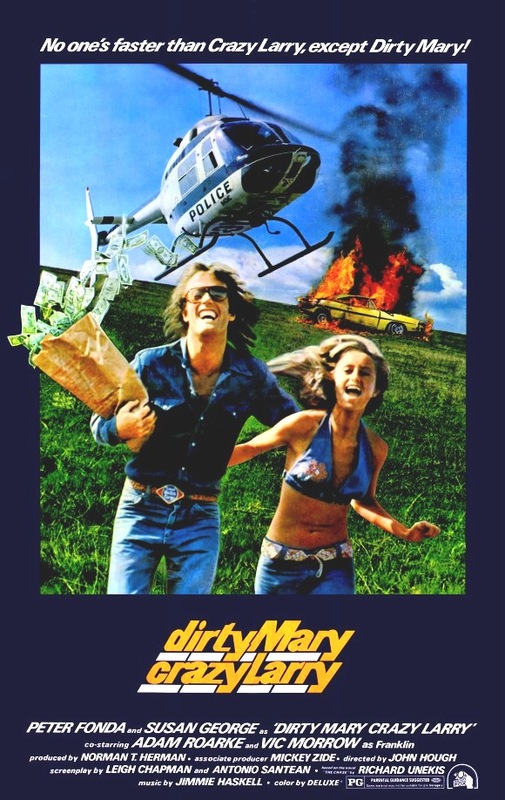 It was only later I realised it was the basis for the 1974 cult road movie Dirty Mary, Crazy Larry, directed by John Hough and starring Peter Fonda, Susan George, Adam Roarke and Vic Morrow. There are, however, significant differences twixt book and film, not the least of which being that in the original novel, there's no "Dirty Mary". The film begins much as the novel does, with NASCAR hopefuls Larry Rayder (Fonda) and Deke Sommers (Roarke) enacting a daring daylight supermarket heist by holding the store manager's wife and child hostage – although in the book Rayder's first name is Floyd while Sommers is simply called Grozzo, and both are ex-cons rather than prospective racing drivers. But a major change comes with the addition of Mary Coombs (Susan George), Rayder's one-night-stand, who hitches a ride with the heisters: Mary is an invention of the movie, and doesn't appear in the novel. 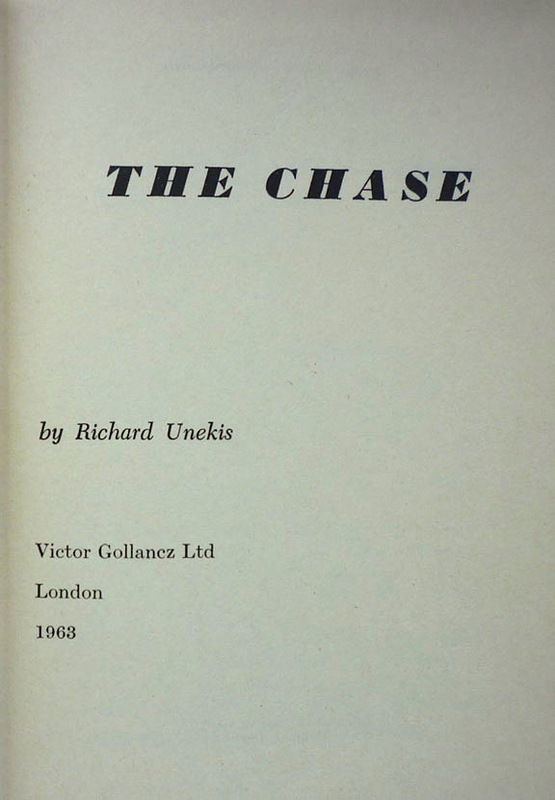 Moreover, the approaches and aims of the book and the film are quite different, as Richard Unekis had a very specific concept in mind with The Chase. The Wikipedia page for the adaptation of Dirty Mary, Crazy Larry boasts a pretty detailed account of how the various changes came about, so I shan't dwell on them here. But it's also unfairly dismissive of Unekis's novel, calling it "an out of date book with little literary value except for a car chase". In fact The Chase has more going for it than that. Admittedly there's not much in the way of character development, but then neither is there in the movie; Unekis is more interested in exploring applied mathematics and probabilities, in particular how to "maximise or minimize the chances for interception" – in other words, Game Theory. In making their escape, Rayder and Grozzo utilise the gravel roads "running straight by the compass in all four directions" to the south of Chicago. 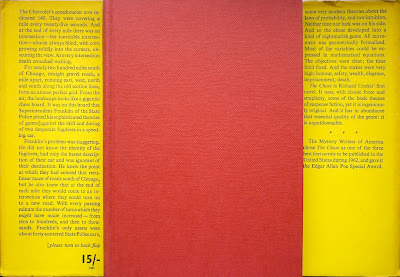 "From the air," Unekis notes at the novel's outset, these roads "make the countryside look like a giant checkerboard, running perfectly flat all the way to the horizon. There are so many roads that, in any manhunt, it is impossible to block them all. The state police do not even try. They just block the major highways—and hope." Enter Superintendant Franklin, the man heading up the hunt for Rayder and Grozzo. Instead of following the standard protocol, Franklin draws on his naval background plotting positions of submarines in order to work out where Rayder and Grozzo are heading, and what their most likely route will be. The result is a tense, clammily exciting game of cat-and-mouse, as Franklin deducts that the pair are headed for Chicago and directs the police cars at his disposal to cut them off, and Rayder and Grozzo barrel along at terrifying speeds on the dangerous gravel roads, a couple of times escaping seemingly certain death by the skin of their teeth. 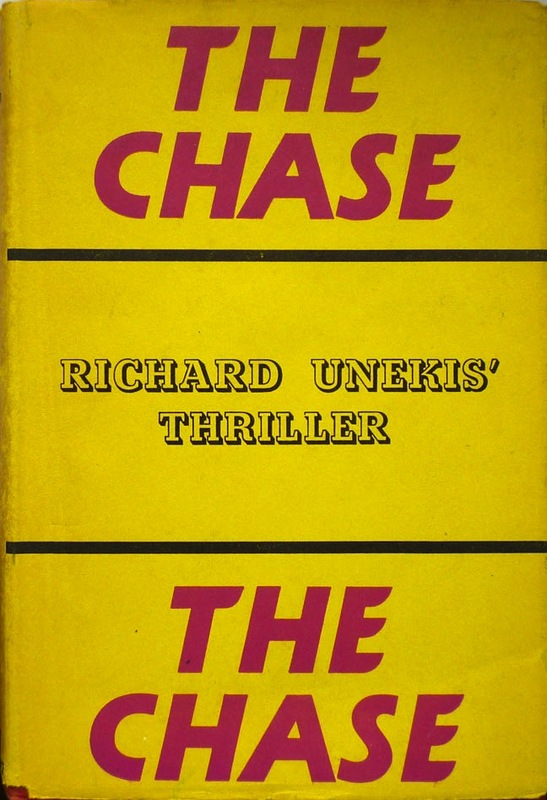 Aside from a 2009 obituary, there's little in the way of information about Richard Unekis available online; The Chase was his only published novel, and fell out of print decades ago – there are only around twenty copies of the book in any edition available on AbeBooks (among them a single Gollancz first). 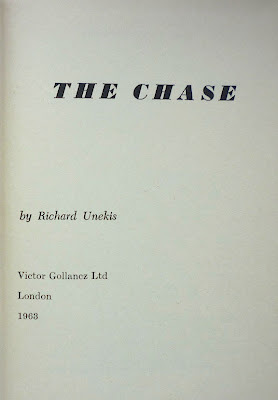 But the Edgar Awards committee for 1962 thought highly enough of The Chase to shortlist it for the Best First Mystery Novel prize, and to my mind it deserves rescuing from obscurity: it's not perfect by any means, but in its intriguing deployment of mathematics in a high speed pursuit scenario, it displays enough ambition to make it worth a second look. Interesting post Nick. Not only have I worked for Gollancz (1969-1984) but I have also collected (and sold) their crime fiction output for some 30+ years but I have never seen this title in the tens of thousands of books that have come through my hands. (Also slightly aggrieved that I must have missed it on my last trip through Lewes). 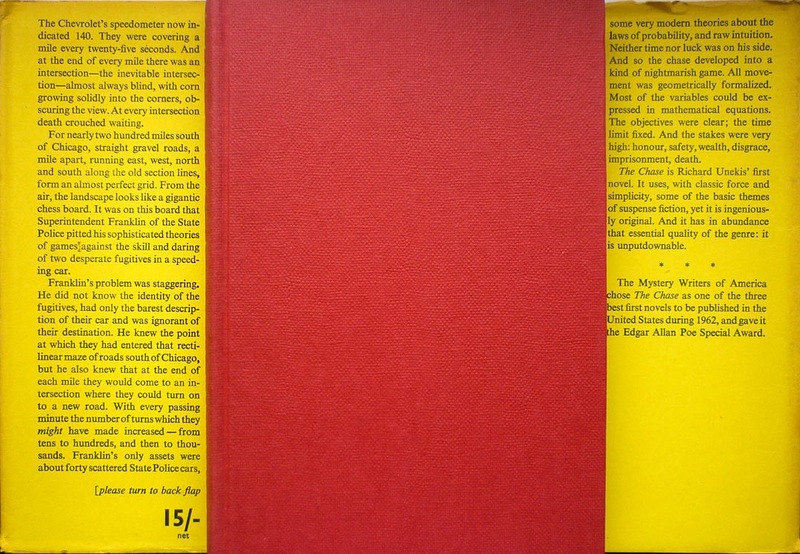 There are two extremes to VG's blurbs for his crime fiction: nothing at all for some of the Edmund Crispin titles - or using both inner flaps AND the rear cover to give away virtually the whole plot. I've got a few Gollancz firsts that do exactly that, Ralph; this one springs immediately to mind. As for The Chase, there is one other relatively inexpensive Gollancz first on Amazon Marketplace at present if you're curious. Ha, you may be right there. And no, there's not really a place for game theory in Crazy Mary – it's not that kind of movie – but there are some interesting ideas at the heart of The Chase. It certainly deserves more than a dismissive mention on the movie's Wikipedia page and an equally dismissive Kirkus note – hence this post. Which is one of the main points of this series you're doing--we shouldn't assume that just because a not very well remembered novel has been overshadowed by a beloved movie adaptation, that means the book doesn't deserve to be remembered as well. It's just that realistically, it rarely ever will be. "Cool Hand Luke", the novel, is a fantastic piece of writing, and I've never met another person who's actually read it. I'm a huge fan of the Paul Newman movie, but I can't help but feel that the book tells the same story better--only without that indefinable something that is star charisma. Ken Kesey's "One Flew Over the Cuckoo's Nest" (the story of which bears remarkable parallels to "Cool Hand Luke", even though the two books were written around the same time) has survived in the public memory much better, in spite of the Oscar-winning Jack Nicholson movie, mainly because Kesey developed a much bigger reputation than Donn Pearce, who really only had one good book in him. Hello Todd. I realised when I saw your comment that the link to Unekis's obituary was broken. I've fixed it now – and I'm posting it below as well. It includes the name of his wife, Irma Elaine Unekis, his three sons, his sister and his brother. Hopefully you should be able to track down one of them. Hi there. I'm a somewhat recent addition to the Unekis clan. Richard Unekis is my husband's grandfather. I unfortunately was unable to meet him before he passed. I haven't read the novel or seen the movie. I was always told that they were both not worth bothering over. I found this review by googling his name. After reading it I think I'll read the book. Thanks for the comment, Kelly. I can't remember enough about the movie to say whether it's any cop, but the book is quite original and certainly worth a read. If you do read it, let me know what you think. Having seen the film when first released, (& owning it on DVD), & reading the book shortly after that in paperback when it was reprinted under the movie title, there are two things I should mention in defense of how the movie handled the basic premise of the checkerboard rod pattern & the idea of the "Game Theory" as utilized. The substitution of the California pecan groves in the film actually mirrors the road pattern in the book & elaborates upon it; that area is also dead level & with the roads being dead straight & laid out in a checkerboard pattern. Plus, the pecan trees themselves provide perfect cover from Franklin in the helicopter, something added for the film. As for the "Game Theory" utilized so well in the novel, a truncated version of it happens in the film as well, once the helicopter had to land because of being out of fuel, Franklin uses the radio to call in & direct police units that either don't exist, or are nowhere near the area the characters or actually at. He manages to make them overthink & then outdrive themselves, just as in the book. My take on both are that the film is a quintessential 70s car chase action flick, & enjoyable enough for that, (the helicopter/Dodge Charger chase is insanely breathtaking, even now), & the novel is sturdy & well written enough, if perhaps a bit dry, likely due to Unelis using applied mathematics as you described. Still, it was a good read back then & I need to try to track down a copy again.